The D.E. 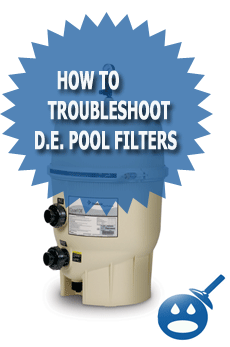 (Diatomaceous Earth) swimming pool filter can be one of the most effective types of swimming pool filters to keep your pool water looking and feeling its best all season long. 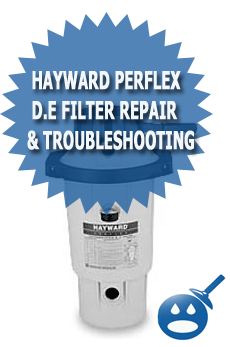 Many popular brands like Hayward, Pentair, and Sta-Rite have been making quality D.E. swimming pool filters for many years. The average D.E. pool filter can last up to 25 years if it is taken care of properly. Some ways to take care of your swimming pool filter properly are to make sure that your swimming pool is maintained though tout the year. Even things like not covering the pool over the winter can make the pool filter work harder during the season which will ultimately result in a shorter lifespan for the filter. Properly back washing your swimming pool filter at least once a week is also another way to keep the life of the filter long. After a while however there will come a time where you will have to take apart your D.E. pool filter and clean all excess D.E. from the grids, fingers and manifolds. You will also want to inspect all the internal parts like o-rings, filter grids, filter fingers(Hayward EC-series) to make sure they do not need to be replace from normal wear and tear. Cleaning the D.E. Pool filter can be done with some basic hand tools, a garden hose and a milk crate or something to put the filter elements on. Cleaning the D.E. 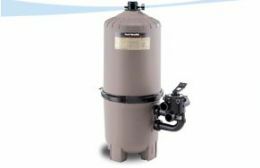 swimming pool filter can take anywhere from 2 – 6 hours depending on your skill set and how dirty or old your pool filter is. You will also want to make sure that you do this all in one day so that you don’t have the filter away from your swimming pool to long which could make the water condition of the pool even worse. The First thing you will want to do before you take apart and clean your D.E. pool filter is to make sure that the filter system is off and unplugged. If you have a swimming pool timer you will want to make sure that the timer is manually set to the off position. The next thing you will want to do is to make sure that you unplug the swimming pool pump from the electric source. Most swimming pool pumps have some something called a “pigtail” which is basically a wire that runs from the pool pump to an electrical outlet box nearby. The best thing to do is to actually unplug the pump as well. Depending on what type of D.E. swimming pool filter you have will depend on how you will have to take it apart. Some pool filters have something called “belly bands” which hold the pool filter tank together at the center making it easy to preform repairs such as cleaning the filter grids. Other types of filters have bolt patterns that will contain many bolts that you will have to remove one by one. Most newer filters these days use the belly band model rather then the bolts that you will have to remove one by one. 1) Make sure that the filter system is off as described above. 2) Open the air relief valve on the top of the filter tank. 3) Remove the drain plug or open the backwash valve. 4) Loosen the Belly band nut and remove the spring and washers. 5) Pry the tank open from the center with a Flathead screwdriver or small pry bar and remove the filter grids. 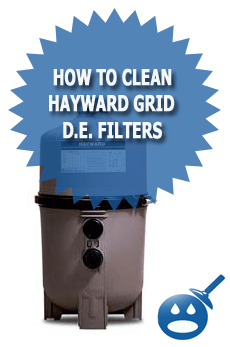 Once you have taken apart the filter tank and you have the grids or fingers exposed you will now want to clean them. What you will need to do is to take a garden hose and completely rinse the entire surface area of the grids and the fingers. This simply means you will want to spend some time and really give both the fingers and the grids a good cleaning. You of course will only either have grids or fingers. You will not have both in a filter. As we mentioned above, some pool filters use grids and some use “fingers”. Both of these can be washed the same way. Using a garden hose with a spray attachment, wash and rinse everything from top to bottom until you notice that the filters or the grids are now starting to turn from a brownish yellow to a bright white. If you have rinsed off all of the extra D.E. from the filter and your fingers and grids are still yellow you might need something called an acid wash. The best thing to clean the fingers and grids with is high pressure from your garden hose. If you have a local pool store nearby you can also pick up some filter grid cleanser that will also help you clean the grids and fingers even better. If you want you can also pick up something called a “filter cleaning wand” which will attach to your garden hose and also help you clean your filter better. After you have cleaned the filter and re-assembled the filter system you will of course now want to get your swimming pool going 100%. In order to do this you will need to do a few things. 1) Make sure to adjust all your pool chemicals within the proper PPM Range. 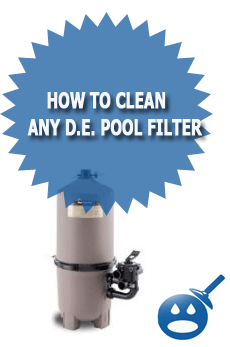 2) Make sure to add the proper amount of D.E to the filter system by looking on the side of the pool filter. 3) Make sure you backwash your pool filter at least once a week to keep the filter at it’s best. 4) Make sure to vacuum your swimming pool once a week so that the filter does not have to work so hard. If you properly clean your D.E. pool filter as we explained above and make sure to follow the four other simple rules, then you should be able to swimming in a clean, clear blue swimming pool all season long without trouble. We have a inground pool. We have taken the filter (de) apart and cleaned the filters. This filter has about 30 screws to take apart , then get the top off and get the filters out. This was ajob from H—. Anyway the problem is now to get it back together. The big problem is , how do we get the rubber seal to stay on the groove, which is not much of a groove while we get the top back on which is heavy and big? I was thinking of using glue to keep it in place. I’m sure that is a bad idea. PLEASE HELP!